Electron microscopy is a valuable tool for elucidating the three-dimensional structure of macromolecular complexes. As the field matures and the number of solved structures increases, the existence of infrastructures that keep this information organized and accessible is crucial. Instruct is all about integration: Information integration to generate new biological knowledge and it is in this context that we recently published a work reporting on the development of new infrastructures for information organization and sharing, critical aspects in our integrative view. The work formed part of an Acta Cryst D special issue covering the CECAN Collaborative Scientific Software Development Meeting on Integrated Software for Integrative Structural Biology that we organized in Oxford in May last year together with Drs. Chris Morris, Martyn Winn, Alexander Bonvin and Keith Wilson. The concrete example of integration shown in the Figure, the “Pepper” application. offers an interactive graphics environment in which it is very easy to visualize, combine and query across multiple data sources. 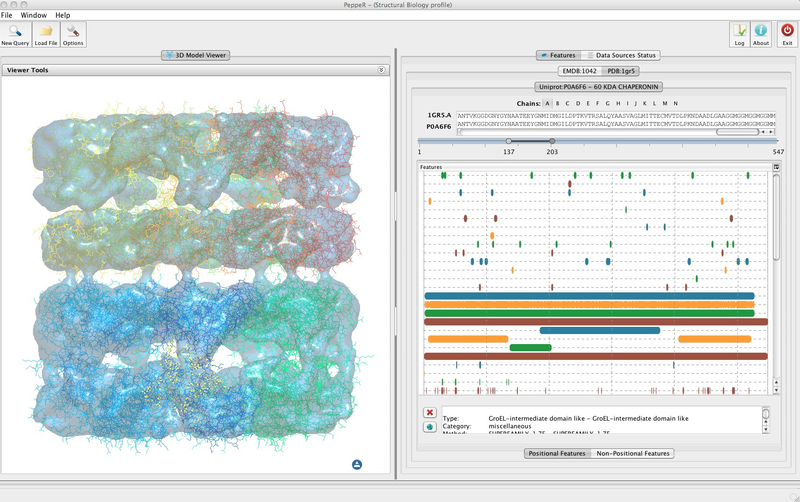 In particular, Pepper is an application aimed at the visualization of hybrid models together with their biological annotations (Macias et al., 2007). These hybrid models, in turn, combine information at medium resolution obtained from three-dimensional Electron Microscopy (3D-EM), together with data provided by other techniques with higher (atomic) resolution: X-ray diffraction and NMR mainly. The establishment of this correspondence at different resolution levels allows the allocation of features and annotations, related to the underlying protein and gene sequences, into the three-dimensional maps (see Figure 1 for details). Macias, J. R., Jimenez-Lozano, N. & Carazo, J. M. (2007). J. Struct. Biol. 158(2), 205–213. Figure 1: Starting from the EMDB entry 1042 (E. coli chaperonin GroEL), PeppeR is able to retrieve and display a variety of related information obtained from different DAS servers. This information includes: fitted PDB models, protein sequences and genomic and secondary structure annotations. For this particular example,4 DAS servers were accessed and information wasretrieved from 15 of them (those that contain relevant information for this chaperonin). Master in Theoretical Physics by University of Granada, PhD in Molecular Biology by the Autonoma University of Madrid and Senior Member of the IEEE. He directs the Biocomputing Unit of the Spanish National Center for Biotechnology CNB-CSIC, as well as one of the Nodes of the Spanish National Institute for Bioinformatics. He has published more than 150 papers in leading Journals, mostly in the areas of Structural Biology and Engineering using three-dimensional electron microscopy. Besides his scientific duties, he was President of the Spanish Microscopy Society, Deputy Director General for Research Planning and Monitoring of the Spanish Science and Technology Ministry and Deputy Director for Science of the CNB-CSIC. He was also the Principal Founder and CSO of Integromics (www.integromics.com), a fully internationalized spin-off company of the CSIC in the area of Bioinformatics. He has received Awards from the Spanish Academy of Doctors, the French Science Academy and the Japanese Okazato Research Foundation for his research accomplishment, as well as from the Spanish Ministry of Industry for his work in Integromics.